The Hôtel Scribe Paris Opéra is nestled within the 9th arrondissement, one of the most vibrant neighborhoods in all of Paris. Known historically as the “Opera District,” the area possesses dozens of astounding cultural institutions that attract thousands of visitors every year. 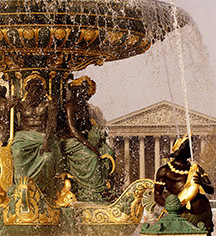 Guests can explore these local destinations from the hotel, including the arrondissement’s teeming array of thrilling opera theaters and concert halls. Hôtel Scribe Paris Opéra is also situated near several excellent shopping centers that feature some of the finest storefronts in Europe. Even the majestic Seine River and its magnificent UNESCO World Heritage Site are just a stone’s throw away! Allow for the Hôtel Scribe Paris Opéra to serve as a springboard for an exciting journey into this fantastic Parisian community. The Palais Gariner is just a five-minute walk from the Hôtel Scribe Paris Opèra. 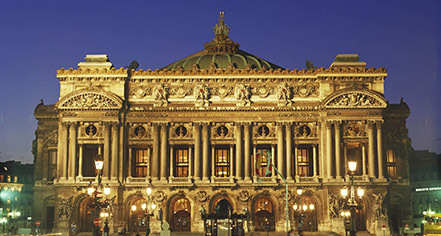 Often regarded as the world’s greatest opera theater, the Palais Garnier stands as a remarkable example of Second Empire architecture. Guests today can tour its gorgeous interior, and catch a theatrical performance in its famous Auditorium. Also known as the Paris Olympia, the Olympia Bruno Coquatrix has been a respected entertainment venue in Paris for over 100 years. Named after its famous owner, many musical legends have performed within this exhilarating building, including Édith Piaf, Marlene Dietrich, and The Beatles. The Olympia persists today as an incredibly popular venue for modern rock bands. While the 9th arrondissement is hailed for its fabulous theaters and concert halls, the district is also highly-regarded for its spectacular shopping destinations. For instance, two of the country’s most famous department stores, the Galeries Lafayette and the Printemps, are situated in the arrondissement. These outstanding retailers sell an amazing variety of designer products from the likes of Chanel, Hermès, and Versace. Once the home of the famous Symbolist painter Gustave Moreau, this marvelous historical building now serves as a museum that commemorates his artistic legacy. Known as the Musée Gustave Moreau today, the location features a fantastic collection of the artist’s awe-inspiring work. The Hôtel Scribe Paris Opèra absolutely encourages its guests to visit the spectacular Musée du Parfum. Established within a beautiful Haussmann-era townhouse, the Musée du Parfum illustrates the intricate process in which French perfumes have been historically manufactured. Come see the stunning perfume organ that the museum has on display! Designated as a UNESCO World Heritage Site in 1991, the lovely banks of the Seine River have captivated countless imaginations for centuries. A multitude of illustrious Parisian landmarks reside near the Seine, including the Tour Eiffel, the Musée du Louvre, and the Notre-Dame de Paris.